Tour de France 2010 Route.. 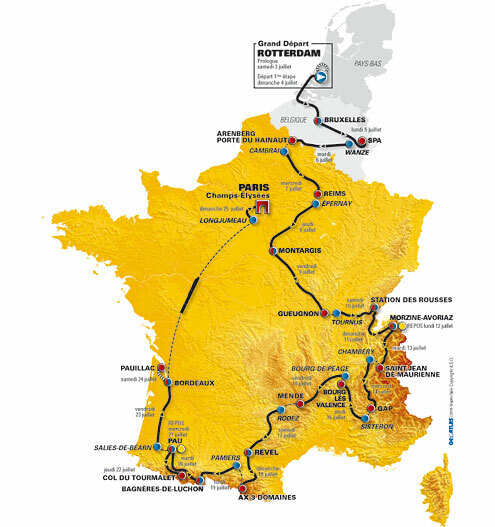 The 97th Tour de France will start from Rotterdam on Saturday July 3rd and finish on the Champs-Élysées in Paris on Sunday, July 25th, 2010. This year’s race will be made up of 1 prologue and 20 stages covering a distance of 3,600 kilometres. 1 individual time-trial stage (51 km). Oooh! I feel the pain! The last 5 occasions when cobbled sectors were included in the Tour were in 1981, 1983, 1985, 1989 and 2004. The selection of the above towns goes through a rigorous process. The town must be able to ensure that the peloton’s arrival and departure is able to take place under optimum conditions in terms of sporting entertainment and rider and public safety. There are lots of other practical considerations as well. So fans of this great and gruelling race, yours truly included, if you’re doing any travels to Europe, you may wish to plan a little detour in your itinerary so that you can witness this great race. I think the tour was very good so far but I cant understand why people greeting the racers are allowed to almost block their path and causing wrecks. car exhaust cannot be too good for the cyclists either. too many of them I believe. Totally agree with you Paul. When the top guys are racing for the seconds, it’s distracting for the riders when spectators try to touch them or wave flags in their faces. I too can’t understand why the organizers allow people to run after the cylists or block their path, especially along the narrow stretches. It annoys us when we see it. Cheers and enjoy the rest of Le Tour.